How have the statuses of the state language (Ukrainian/Kazakh), Russian, and English evolved since independence from the Soviet Union in 1991? What do these developments tell us about the relative authority of the Ukrainian and Kazakh governments over language policy and practice? To answer these questions, this presentation uses a comparative discourse analysis of the constitution, policy documents and reports from the two countries. These analyses, supported by qualitative fieldwork conducted in both countries, indicate that Kazakhstan is more “top-down” and Ukraine is more “bottom-up” in its language policy development “bottom-up” in its language policy development. 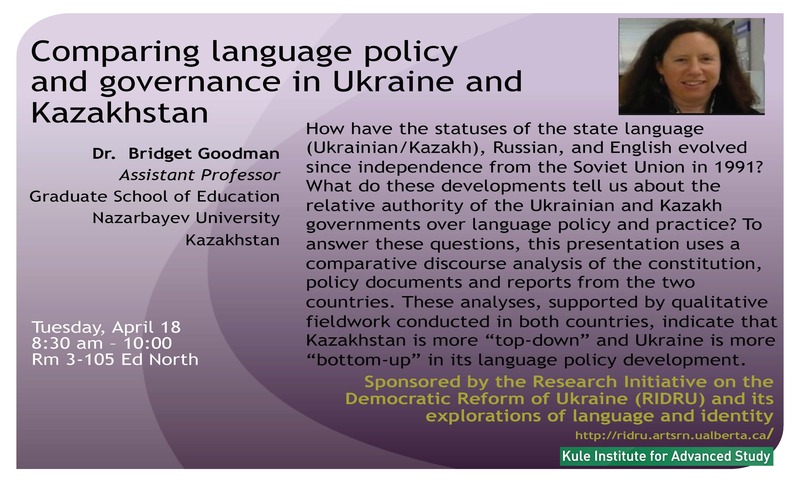 Dr. Bridget Goodman, Assistant Professor, Graduate School of Education, Nazarbayev University.